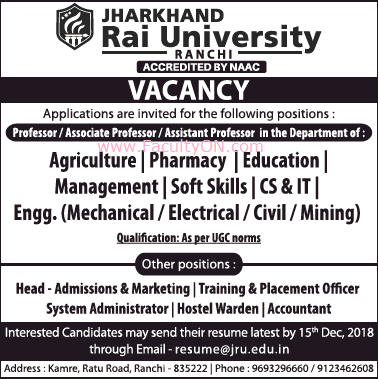 Jharkhand Rai University, Ranchi has advertised in THE TIMES OF INDIA newspaper for recruitment of Professor / Associate Professor / Assistant Professor Plus Non-Faculty jobs vacancies. Interested and eligible job aspirants are requested to apply on or before 15th December 2018. Check out further more details below. About University : Jharkhand Rai University (JRU) has been established under “Jharkhand Rai University Act, 2011” by Jharkhand State Legislature as per section 2 (f) of UGC Act 1956. JRU is also a member of Association of Indian Universities (AIU) and an ISO certified University, (ISO 9001:2015). Our aim is to create a knowledge pool for the State of Jharkhand by serving the needs of diverse communities. JRU continuously strives to provide quality education to its students through dynamic research, rigorous training and efficient mentorship. The University offers Diplomas, Degrees, Postgraduate Degrees and Doctoral programs in different disciplines. How to Apply: Interested and eligible candidates are required to send CV, copies of certificates along with recent PP size photo the email address mentioned below.